Fun and friendship for the over 50s! Connect is our bi-monthly club for those who aren’t as young as they used to be, or would like to be! Each session contains lots to do, and hopefully something for everyone. So whether you enjoy a game of table tennis, pool or carpet bowls. Or prefer to play board games or puzzles. Or would rather sit quietly and read the paper, or do the crossword. We hope Connect will have something to take your fancy. Tea, coffee and cake are served throughout each session. And there’s the chance to take part in our regular “round the wall” picture quiz. 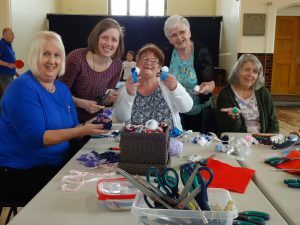 For the craftier members of Connect we run a craft demonstration each time. And each session has a short “thought for the day” when a guest speaker is invited to share something about their Christian faith. All of this takes place from 11.00am and then around 1.00pm we have lunch together (and at £4 a head, it’s an absolute bargain). After lunch it’s time to get those grey cells working again when we have our Big Quiz – a team quiz which occasionally gets a bit competitive…mentioning no names. And then we’re all finished by 2.30pm and looking forward to meeting up again next time! So if you’re over 50 (or approaching it) we’d love to see you. It’s a great way of making new friends…and getting to know old ones even better.